Aqui Te Quiero Ver is a family friendly beach restaurant serving delicious seafood and Spanish specialties at Real de Zaragoza beach in Marbella. You were there? Please send us your evaluation and grade. We would love to hear from your family! This is a great restaurant for seafood and paella. Located right on one of the best beaches in Marbella with stunning views of Africa and Gibraltar. Lounge chairs available for rent. Reservations a must in summer. Location: Urb. Lunamar (Las Chapas), Playa Real de Zaragoza (km. 189.6). Off the N340 just before the Las Chapas exit (if you´re coming from Marbella center). Pass the Elviria turnoff, then turn right at the first exit after the Repsol petrol station (on your right hand side) where you will see the Centro Internacional de Turismo (International Tourist Center) on the corner. This road is called Avenida de Cibeles. Take this road off the N340 and head all the way down to the beach. Turn right at the fork in the road and follow the road and signs for Aqui Te Quiero Ver. Hours: Open Monday for lunch only from 12:00pm - 4:30pm. Open Tuesday through Sunday from 12:00pm - 5:00pm closes for a break then re-opens from 8:00pm - 11:00pm. Closed for winter holidays from December 22 - January 15. 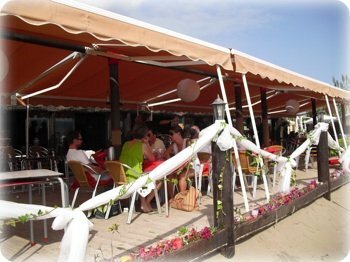 Mom's evaluation: Aqui Te Quiero Ver is a typical chiringuito (beach restaurant) in Marbella. It´s situated on one of the most beautiful beaches in Marbella - Real de Zaragoza beach so you´re guaranteed good clean sand and beautiful waves. The service is great and the food is always fresh. This chiringuito has been around for a long time and has a loyal clientele so you need to make sure to book your table in advance, particularly if you are visiting in July and August when tourist season is at its peak. There are lounge chairs available for rent, but there aren´t a whole lot, so it´s a good idea to get here early if you´re going in summer. Last time I went here the restaurant was closing early in preparation for a wedding. They had a beautiful arch for the bride and groom right in the sand with chairs for the guests. I could imagine how amazing this wedding was going to be with a gorgeous sunset and spectacular views of Morocco and Gibraltar. This restaurant is kind of hidden away and not easy to find, so when you´re on the N340 be on the lookout for the Repsol station and Tourist Center where you´ll be turning. Once you turn you simply follow the road straight toward the water and follow the signs.